Professor Black, who went to the Balkans following the Kosovo war - where her job was to piece together the bodies of massacred Kosovan Albanians - said this discovery had changed the direction of the whole investigation. "In terms of the brutality of the ethnic cleansing, it was thought women and children quite frankly weren't worth wasting the bullets on," added Professor Black. "Pregnant women were bayoneted because that way you got rid of a woman because that wasn't important and you got rid of the next generation because you didn't want them to survive. So I know what sort of pattern I am looking for." 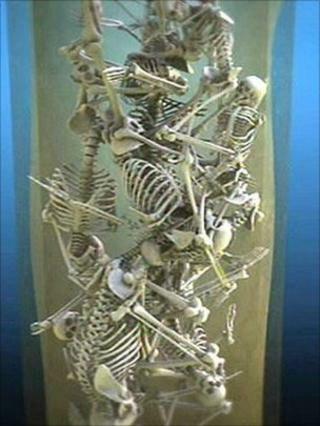 Pictures taken at the time of excavation suggested the bodies were thrown down the well together, head first. 1100s: Resentment against the Jewish community grows over their perceived wealth and belief they killed Jesus. The "blood libels" - Jews are accused of the ritual murder of Christian children. 1190: Many Jewish people massacred in York. In Norwich they flee to the city's castle for refuge. Those who stay in their homes are butchered. And historians pointed out that even during times of plague when mass graves were used, bodies were buried in an ordered way with respect and religious rites. Norwich had been home to a thriving Jewish community since 1135 and many lived near the well site. But there are records of persecution of Jews in medieval England including in Norwich (see fact box). Sophie Cabot, an archaeologist and expert on Norwich's Jewish history, said the Jewish people had been invited to England by the King to lend money because at the time, the Christian interpretation of the bible did not allow Christians to lend money and charge interest. It was regarded as a sin. So cash finance for big projects came from the Jewish community and some became very wealthy - which in turn, caused friction. "There is a resentment of the fact that Jews are making money... and they are doing it in a way that doesn't involve physical labour, things that are necessarily recognised as work... like people feel about bankers now," said Ms Cabot. The findings of the investigation represented a sad day for Norwich. Ms Cabot added: "It changes the story of what we know about the community. We don't know everything about the community but what we do know is changed by this." History Cold Case: The Bodies in a Well will be on BBC Two at 2100 BST on Thursday 23 June 2011 and afterwards in the UK on BBC iPlayer.